Iceland is cold. Oh so very, very cold. As I walked from coast to coast with my brother, the wind was so relentless that it made my face bleed. The snow on the tent each morning was an unwelcome surprise. What I have realised about the world, is that it is much easier to live in when it is warm. Thus I am escaping the cold and heading into the warmth with little other than my hammock and a sleeping bag. What more do you need when the world is warm and you can sleep under the stars? But where to go? That was my problem. There are so many places to go in the world that will be warm at this time of year, but I can only go to one. And right now, I am in Europe. Since leaving Korea, I have decided to spend the rest of the year around Europe and it was with this in mind that I pulled up a Google map and begun looking up places way down south. After researching various climates, I was pretty happy to see that Europe remains warm at this time of year. Overnight temperatures are almost twenty degrees which means I’ll hardly even need a sleeping bag, let alone the one that I took all the way across Iceland. But then came another problem: how could I get to this place so far away? A quick internet search revealed that only certain flight routes were cheap. Thus my search begun once again. After more map searching and flight route checking, I found the perfect option, a flight to southern Greece for £31. From here, I will be warm, I can search for islands (maybe even hitchhike a boat) and feel the inside of my body being warmed up. Finally. So here goes. After Greece, I don’t know what comes next, but I will be warm and I will have been sleeping in a hammock for several weeks, thus I should be happy. This is not a journey like I normally do, no pushing myself, no completing a traverse: this is a trip to visit my good friend, the sunshine. I look forward to seeing him. Update: I hitchhiked to the port, took a boat to Naxos, an island I know nothing about, then walked and hitchhiked until I found a quiet little villa that has only been part built. I have been squatting there for several days, sleeping in my hammock in the garden and eating dinner on the balcony, looking over the sea just one hundred metres away. I even found a tap I can drink from and four hundred metres away is a toilet and a mini market. Luxury doesn’t have to cost much, you just have to be willing to push yourself a little bit. 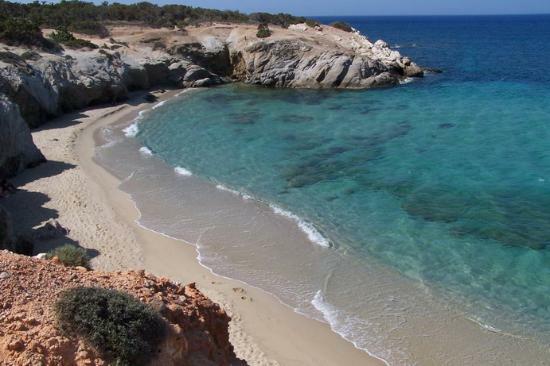 Jamie, you should visit the island Ikaria if you have the chance. It’s completely untouched by mass tourism, it’s perfect for surfing and still quite traditional and unique. Thus also rather cheap. There are hot springs on one side of the island and some kind of modern hippie village (called Nas) on the other side. Hitchhiking is very common, because there are no other means of transportation. So every other car picks you up and the people there are the loveliest. And as far as I know even the healthies in Greece, people over 100 years old are not unusual there. I can’t wait to get back there myself. That sounds perfect Tim. Sadly I didn’t see this comment in time otherwise I would have loved to go there, but will keep your advice in mind for when I return to that part of the world. Both the hot springs and hippie village sound wonderful. Thank you for sharing the advice. Kelly, I’m sorry, I didn’t check my messages until now otherwise that could have happened. I hope you had an awesome time in Greece. It is certainly warmer than Iceland. Living the dream chap, and long may it continue.